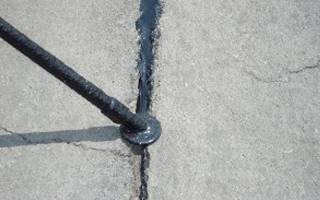 Crack sealing is used as a first defense against pavement deterioration because it offers several important benefits. Effective crack sealing keeps water from entering and weakening the base or sub-base. It helps preserve the pavement adjacent to the cracks; prevents sand, stone, and dirt from making its way into open cracks causing compressive stresses; and extends pavement life by minimizing crack growth. Proper attention to cracks will prevent problems from spreading and double the life of the pavement. Pavement repair in the early stages of deterioration will pay big dividends later by delaying costly resurfacing. A hot poured rubberized crack sealer designed to protect against moisture intrusion- the leading cause of pavement distress. This product remains flexible under heavy loads and during freeze/thaw cycles. A specially formulated heat stabilized crack sealing material, designed for oil jacketed kettles, will be used. Material shall be premium quality, high performance hot poured polymer rubberized asphalt sealer and joint sealing compound. Material shall meet or exceed ASTM Specifications D 1190, Federal Government Specifications SS S 164, State Highway Specifications and any local Specifications. Cracks will be cleaned with forced air to remove loose material to provide a reasonably clean surface for adhesion. Routing of cracks and or removal of vegetation within cracks will be additional cost unless otherwise stated in your contract. Any debris resulting from this process will be removed upon completion.